Thank you to everyone who braved the frigid temperatures and came out to our one-year anniversary show! We were able to donate $115 to Big Brothers Big Sisters- Chicago! From Left: Christina Brandon, Lauren Swihart, Mayra Morris, Kelly Ann Corcoran, nicolle neulist, Gina Watters, Carley Marcelle Madi, Baertrum, Dee Fuentes. (Not pictured: Lindsay Eanet). Musician, singer, and songwriter. Grew up in Toledo, lived in Cleveland for 2 years, moved from Ohio to Chicago for a girl and to pursue a dream. Lost what felt like everything - love, trust, sleep, money, jobs, and maybe even my sanity, but...the dream never died. Carley Marcelle Madi is a relentless explorer of people, ideas and possibilities who acts, writes, and produces a wide array of creative experiences that advocate for increased awareness and the intentional design of global future. She will release a web series and a podcast this Spring and has many other projects underway. Find out more at carleymm.com or follow her on Instagram @carleymarcelle. 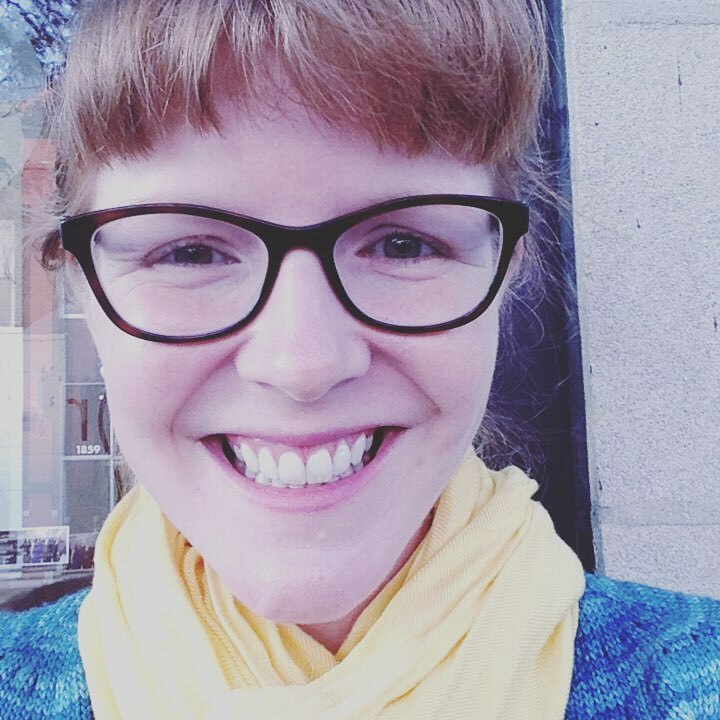 Marya Morris is a city planning consultant and freelance writer and editor. She's been telling stories at venues all over Chicago since 2016 and was the winner of the Moth GrandSlam in October 2018. Lauren is a mom of two young girls, a wife, a bleeding heart, and an entrepreneur lacking follow-through. She loves working with her hands and is desperately trying to pass on her love of building to her toddler who currently just wants to hammer once or twice. Lauren tries to become an expert at everything she does and has figured out that being a good listener, especially when people aren’t expecting her to be, is the best way for her to learn. Gina Watters is a writer living in Chicago. She has read her stories at Essay Fiesta, Miss Spoken, Story Club, Feminist Happy Hour, You’re Being Ridiculous, Write Club and others. She is also featured in Rust Belt Chicago: An Anthology from Belt Publishing. 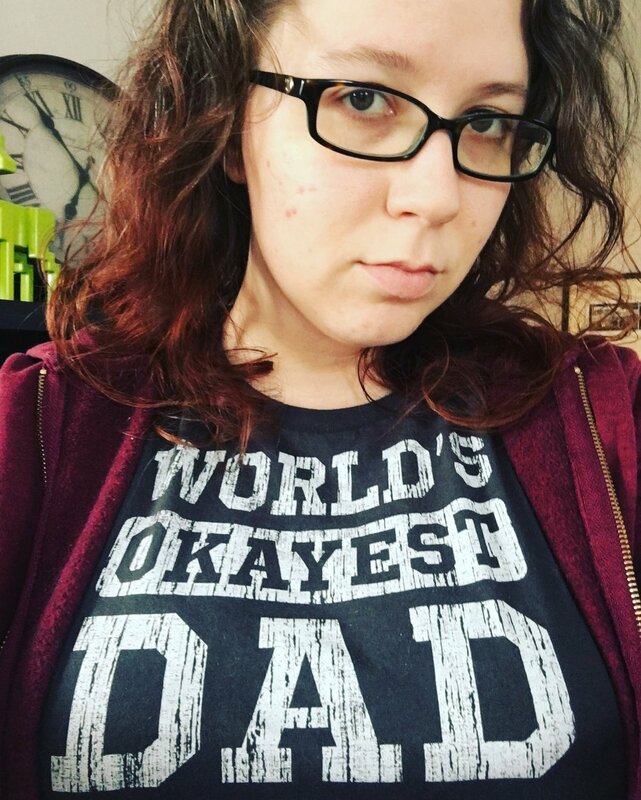 Lindsay Eanet can be seen reading around Chicago at shows like OUTSpoken, You’re Being Ridiculous, Story Jam and this one, and next to you at your favorite bar, skipping over all your songs on the jukebox. She has a weakness for reality competition shows and cries an average of four times during every episode of American Ninja Warrior. Follow her on Instagram @lindsayeanet. nicolle neulist lives a few blocks from here. Most of their brain is taken up with arcane trivia about horses who run around in circles, but occasionally they can string words together about other things. KellyAnn Corcoran was the founding Artistic Director of Dolphinback Theatre Company and Served as Artistic Director for Center Theater. She has been writing, directing, acting and solo performing in Chicago for over 20 years. Recently she, with Prop Theater produced and performed “Hillary! The Musical”. Her latest solo piece Sink or Swim went up in This year’s Rhinofest. She is currently working on a collection of biographical essays for publication. KellyAnn sits on the board of the social justice Theater Company, Still Point Theatre Collective which is about to turn 30 and, this Fall, will be directing their new touring show on Human Trafficking. She’s the mom of four homeschooled kids from six to 14 and is deeply grateful to Duly Noted for this opportunity and the chance to perform her work somewhere they aren’t allowed to come. Thank you everyone who came out to support all the performers at Duly Noted. We raised $125 for Meals on Wheels Chicago! We’re taking December off, but we’re back for the one-year anniversary show on January 29! From left: Dee Fuentes, Zapata, Abby Dryer, Jessica Katz, Charles Schoenherr, Christina Brandon, Molly Schlemmer. Not pictured: Laura Hawbaker and Lindsay Eanet). Thanks to everyone who came out to the Hope shop on October 30! $145 were raised to support SocialWorks, a youth empowerment charity based in Chicago. We are looking for performers for upcoming shows! Checkout guidelines for musicians and storytellers. 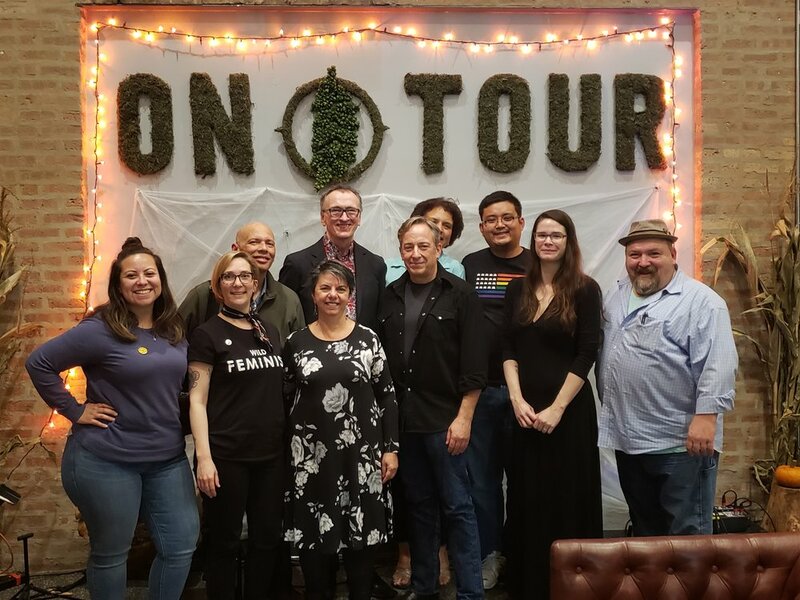 From left: Dee Fuentes, Christina Brandon, Buddy Fambro, Beatriz Badikian-Gartler, Patrick Curtin, Matthew J. Lipman, JJ Maze, Randy Kim, Stephanie Ruehl, Paul Barile. October 30 at On Tour Brewing! JJ Maze kicks of the show at 7:30, followed up six true stories on the theme HOPE. The show is FREE but donations are taken. They benefit performers and local charity SocialWorks. Jade J. Maze is a singer, composer, and educator that transplanted from the West Coast to Chicago in 1994. Her voice crosses many genres. Jade’s debut memoir Walk Until Sunrise is described as " A stunning memoir of loss and redemption." It is currently a semifinalist in the BookLife Prize competition and a finalist in the Golden Aster Book World Literary Prize. 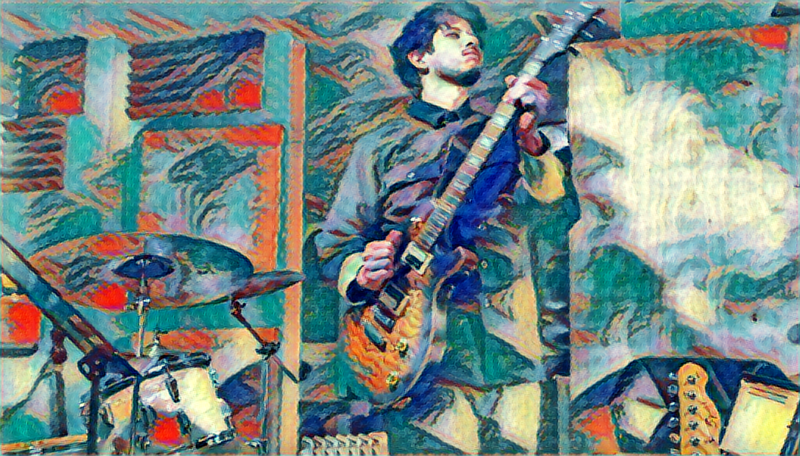 Joining Jade is Chicago’s own Buddy Fambro, a guitarist and composer of note. The single “One Flew” off his Cd Purpose receives national airplay. You can hear both Buddy and Jade on their CD Duo. Beatriz Badikian-Gartler was born Buenos Aires, Argentina, and has lived in the Chicago area for over forty years. Badikian-Gartler holds a Ph.D. in English from the University of Illinois at Chicago and teaches at various institutions of higher learning in Chicago. Her second full length collection, Mapmaker Revisited: New and Selected Poems, was published in 1999 from Gladsome Books in Chicago. Her first novel Old Gloves – A 20th Century Saga was published in 2005 by Fractal Edge Press in Chicago. Stephanie is an artist, cosplayer, and maker of things. She's a huge nerd, and she's at her best when she's learning something new, or creating something with her bare hands. Paul Barile is a writer/actor working and playing in Chicago. His debut novel “My Brother’s Hands” (Lexographic Press) is out now. His audio-book “Chasing Happy” (Mint 400 Records) is available wherever fine mp3s are sold. His comic book “The Summit of Justice” will be out February 24, 2018. His poetry blog is thepoemguy.wordpress.com. In his spare time he writes. Thank you to everyone who came out to On Tour Brewing and donated money to Healthy Schools Campaign! We raised $112 for them! Checkout www.healthyschoolscampaign.org to learn more about the Chicago-based non-profit — or donate! 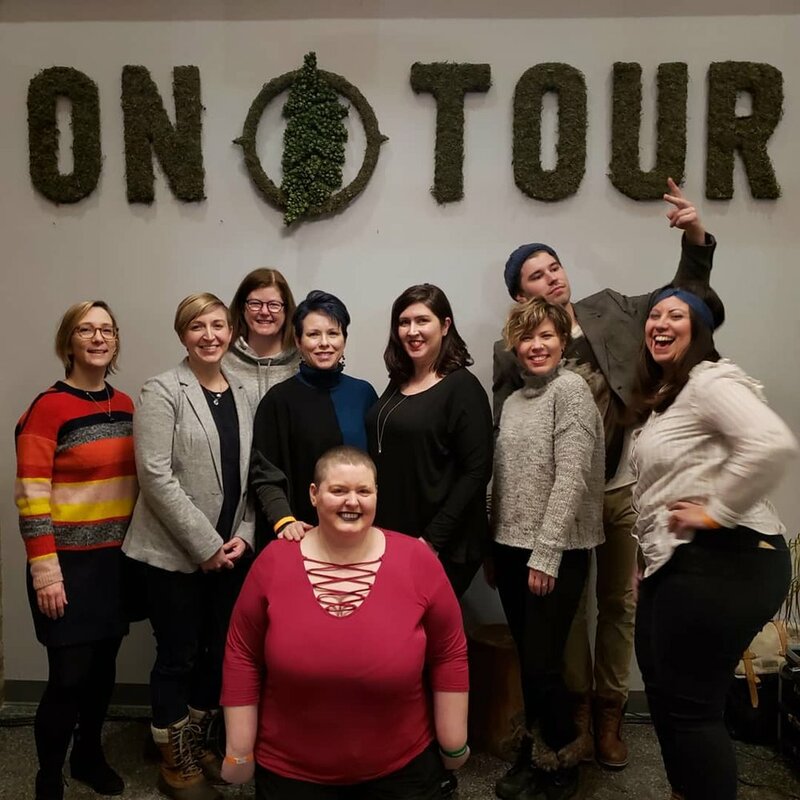 From left: Leigh Yennrick and Travis Cook of Tiny Shoulders, Dee Fuentes, Andrew Rostan, Abby Dryer, Elizabeth Gonzalez, Murphy Row, Sarah Bowden, Megan Grandstaff, Christina Brandon, Phyllis Porche. September 25! Tiny Shoulders kicks off the show with music at 7:30. Then seven true stories on the theme PLEASURE. The show is FREE; donations are welcome. They go to the performers and, this month, to local non-profit Healthy Schools Campaign. Tiny Shoulders is a folk duo based in Chicago, Il. and consists of Travis Cook (guitar, vocals) and Leigh Yenrick (vocals, percussion). They do not care for pigeons. They have big dreams, but such tiny shoulders. Sarah Bowden is a teaching artist, whose plays have been produced in Chicago, New York, Philadelphia, Toronto, and Stockholm. 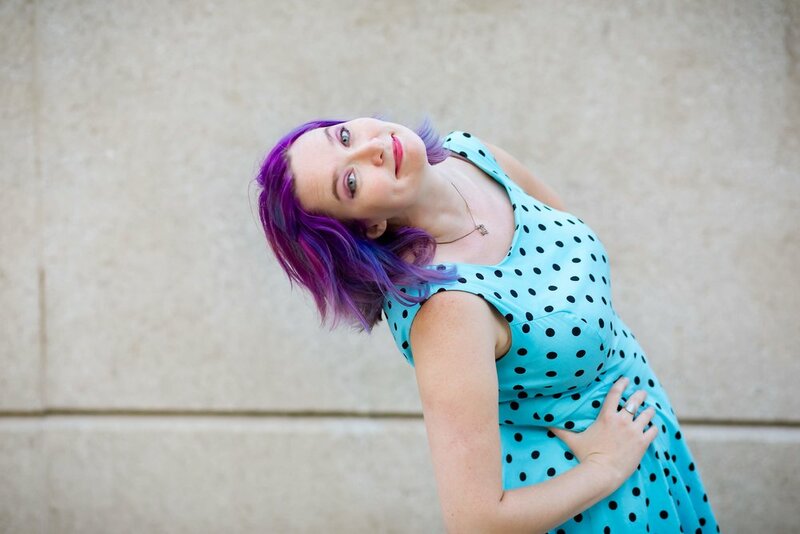 Her work has been developed and presented by the Greenhouse Theatre Center, MPAACT, The Arc Theatre, the Pittsburgh Irish & Classical Theatre, the Nylon Fusion Theatre, Monkeyman Productions, Southern Illinois University, and Ohio University. Murphy Row is a former stand -up comedian and professional MC who gave up the glorious life of self hate and shallow laughs to pursue a deeper meaning in his art. Murphy is an accomplished story teller and performer who loves to delve into his own history and find beauty and meaning in the ridiculous, painful and even mundane experiences of life. His work can be found as a contributing writer at DrinkersWithWritingProblems.com. By day, Elizabeth works to make the world a more diverse and inclusive place. By night, Elizabeth can be found tearing up the stage with her vintage dance troupe, The Galaxie Girls, or spinning the music to make you move at Bluetopia. Phyllis Porché is a writer, teacher, and storyteller. She’s from the south side of Chicago and never leaves the house without wearing earrings. Abby is a very opinionated person who wants everyone to be happy. She likes to simplify things that overwhelm other people and help make sense of the craziness of general life. She’s trying to become the next Dear Abby with her YouTube channel, Ask Abby Dryer, and has started talking about how to communicate in a #metoo world. Megan Grandstaff is an avid seamstress and knitter who has called Chicago home for ten years. She started writing her stories down after the 2016 election, and she hasn't been able to shut up since. Before he was thirteen, Andrew Rostan realized he wanted to spend his life telling stories after getting obsessed with books, movies, and LucasArts computer games (Monkey Island Forever!). He learned how to write by honing his craft at Emerson College and put that knowledge to excellent use in his graphic novel An Elegy for Amelia Johnson, which USA Today named one of the best comics of 2011. Andrew moved around the country before putting down roots in Chicago. When not haunting the Music Box Theater, independent bookstores, Scottish pubs, and phone banking for midterm candidates, he is hard at work on several projects, including his first novel. His comic book memoir about his experience as a five-time Jeopardy! champion, Form of a Question will be in stores everywhere on November 20. He will talk about pop culture until you want him to shut up. Thank you to our fantastic performers, to On Tour Brewing (who provided surprise snacks!) and of course to the gracious audience. We raised $131 for One Million Degrees! August 28! At On Tour Brewing (1725 W Hubbard)! Myles Teague kicks off the show with music at 7:30. Then six storytellers share their own true stories on the theme FAITH! Show is free, but donations go to the storytellers and to Chicago-based non-profit One Million Degrees. Myles Teague is a Chicago based hip hop poet and producer that aims to make spiritually and socially conscious beats and rhymes. In a time when people are being heavily oppressed for their religion, race, or way of life, it’s important to make the people aware of their God given right to free will! He takes his influence from contemporary artists like MF DOOM and Yasiin Bay (Mos Def) as well as traditional poets like Rumi and John Milton. Peace and blessings! 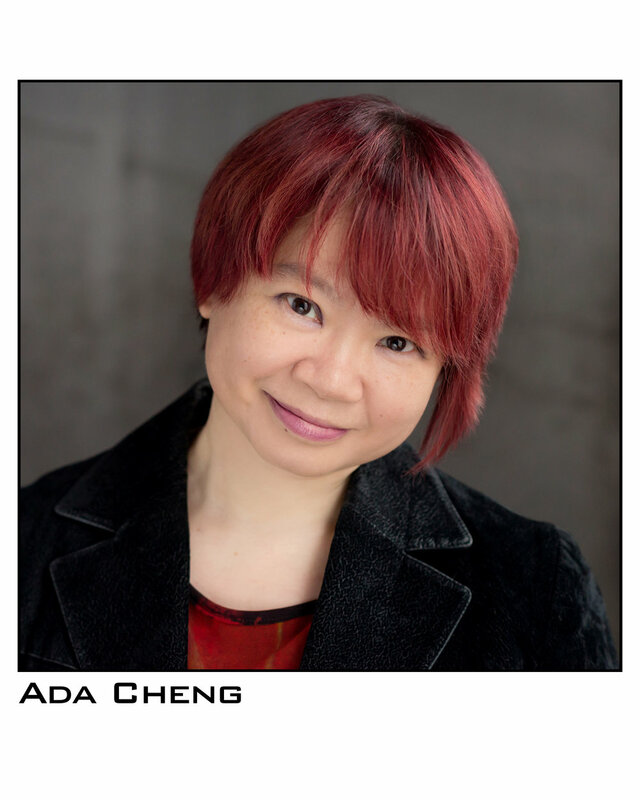 Ada Cheng is a professor-turned storyteller and performing artist. She is also the producer and host of the show Am I Man Enough? : A Storytelling/Podcasting Show, where people tell personal stories to critically examine the culture of toxic masculinity and the construction of masculinity and manhood. Her motto: Make your life the best story you tell. John is a new writer, a new storyteller, and a marketing professional at a large, independent, Chicago-based marketing innovation agency. For almost three years, he was the organizer for Chicago Theater Meetup and board member and fundraiser for Interrobang Theatre Project, where they earned fourteen Jeff nominations and won four awards in the last two years. John is an enthusiastic and unskilled dancer, loves Irish whiskey, fruit-filled butter-crust pies, and his dogs, Hank and Gabby. Paul Teodo is a retired healthcare exec and long time Chicagoan. His first novel Pastaman is a gritty coming of age story of a troubled young man growing up on Chicago’s south side and his quest for redemption.